There are a great many reasons why people choose to live in cities. The life, the culture, the job opportunities, the sense of community that you can find even in the presence of great numbers of strangers. When we travel from our home city to another, we will always have our individual observations, often details that nobody else will notice. All based on our own urban experience, our personal preferences and our lives in our home city. You will notice tiny details that will escape me if we were travelling together and vice versa. I have lived in Copenhagen for 20 years or so. I know the city well. There are tiny details that I know and love - or hate - but that other long-term residents of the city will never notice. And, again, vice versa. It is often these details that define the inherent beauty of the urban landscape and make it personalised for every user, resident, citizen. For the past two years I have been renting out a room in my flat through airbnb.com. It has been a wonderful experience hosting people in the city that I love and I call home. The thing that I have noticed that relates to this article is the details that these individuals pick up on. A colleague and acquaintance of mine was visiting from Antwerp with his family. They had a great many experiences that we talked about but there were two things that they really had to get off their chests. One of them was that I desperately needed to invest in new plates. The ones I have they found to be incredibly irritating because they are so noisy when you're using your knife and fork on them. I hadn't noticed that before. The other thing was relayed to me in an incredulous tone. ”Where are the flowers?”, they asked. In Antwerp, they have a charming tradition and culture of flowers hanging outside the buildings from the windows in a great many colours. We simply don't have the same tradition here in Copenhagen and that fact amazed them. How can you not have flowers outside every window on every building? 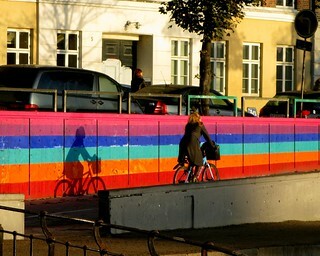 A lot of visitors to Copenhagen, I have noticed, comment on the many colours of bicycles. It would seem that many of the colours, especially the white bicycles, are unusual in many other countries, whereas they are standard fare here. All of this brings me, finally, to the point of this article: colour details on the urban landscape. Or rather, the lack thereof. 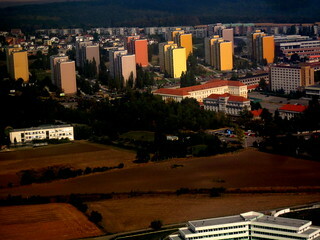 Many cities have a tradition of painting their buildings in bright colours. The old harbour in Copenhagen, Nyhavn, is the ultimate, picture-perfect postcard street in the city simply because of the cheerful coloured buildings. I recall reading that this is not a modern phenomenon. Many of the buildings owned by the wealthier citizens as far back as the middle ages were painted in as bright colours as were available on the market at the time. Apparently we didn't know this until recently but archaeologists have determined this to be the case after finding remnants of pigment on the walls of ancient buildings in Copenhagen. You can certainly understand why, in the heart of a 15th or 16th century city, colour was a necessity, what with the generally drab tones of the clothing of the citizens as well as all the other sensory challenges an overpopulated city centre bombarded you with. Just read the book Perfume, for example, to get an idea of what Paris might have been like. But here we are, at the tail end of almost 100 years of traffic engineering in our cities. We are forced to put our faith in the whims of architects and industrial paint producers to provide us with pleasing and/or interesting colours and textures on our streets. Because god knows the streets themselves are fifty shades of urban grey without any sensuality or titillating experience whatsoever. For the better part of 100 years, we know too well, streets have been the sacred domain of traffic engineers and the automobiles they serve. 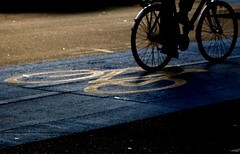 Working in modern urban planning and bicycle urbanism, alot of our work involves thinking differently. Changing the paradigms that we have inherited from a previous century. Our work involves changing, modernising and reallocating the street space but it is not without its challenges. So many good and modern ideas stumble and fall on the doorstep to the traffic engineering department and smack their head on the slamming door. I have now understood that asphalt is the Wailing Wall of traffic engineering. A sacred thing. Nevermind taking away space from cars to widen sidewalks or put in cycle tracks, more often than not you are simply not allowed to mess with the dull and dreary fifty shades of grey. Think about how much urban space is occupied by asphalt. Great arrogant swathes of grey dominating our daily life and visual aesthetics in cities. Cobblestones, at the very least, came in different shades, however, subtle, and they have the added benefit of texture. Perhaps not pleasant to ride a bicycle on but the uneven surface can, in many ways, add to the visual landscape. Since I started noticing this all-dominating greyness in our cities, I've been looking for asphalt versions of the Antwerp flower boxes. Examples in my city as well as others of colour being added to the dismal asphalt equation. Unfortunately, there are not many examples out there to inspire us - from anywhere in the world. In many places, not least in Denmark, there are strict and unquestionable rules and regulations in place regarding markings and colour on the asphalt. I have no doubt that these rules and regulations were put into place in order to maintain some semblance of order in the traffic. I also know, however, that most of these rules and regulations were engineered to serve the automobile. With little regard for aesthetics, the urban experience or the people who inhabit our cities. 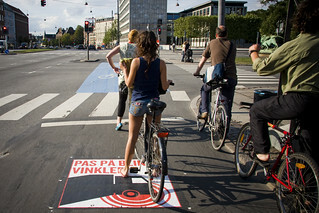 Before these thoughts occurred to me, I remember back in 2008, when one of the more interesting urban experiments in recent Copenhagen history was launched, being amazed at the almost playful red dots and blue and green stripes along Nørrebrogade Street. It was a pilot project, which allowed for much greater freedom in experimenting with the urban landscape. The big red dots signified bus zones. The green and blue stripes signified so-called Flex zones outside shops. Loading zones were set up on side streets and wonderful typography was employed to mark the spot. I just remember thinking that it was so damn cool. I had never seen anything like it anywhere in the world. The asphalt of our cities is one of the greatest unpainted canvases in human history. Blank spaces that are begging to be personalised. I have seen examples on quiet neighbourhood streets in various cities around the world of citizens adding art and colour to the street space but if you think about how much opportunity there is for brightening our cities, it makes you want to invest in the stock of a major paint producer. So let's look at some of the examples that I've seen around the world. Believe me, I haven't seen them all so feel free to add your own examples in the comments with links to images. I'm mostly looking for examples from cities, as opposed to residential streets. Apart from the aforementioned experimental street markings in Copenhagen, the blue colour marking our cycle tracks across intersections is, of course, famous. The choice of the colour blue was not the result of a long scientific research process. It was chosen because it was different and because it was nice and easy on the eye, as well as being easily noticeable to all traffic users. Red and yellow have connotations of warnings and danger. Blue, it turns out, is a colour that tickles the fancy of scientists and psychologists and there has actually been a great deal of research into the colour of late. Researchers at the University of British Columbia discovered that blue computer screens enhanced creativity better than red or white. The colour blue also has the effect of suppressing your appetite. Blue is cool and tranquil. Around half of the people in various surveys around the world say blue is the favourite colour and almost 50% of Americans say that blue eyes are their favourite - even though under 20% of the population have them. If you darken or lighten all the other colours they become something else. Blue, will always be blue. The sky is blue and so is the deep blue sea. Blue, it turns out, was an incredibly cool choice for Copenhagen. Iconic, too. 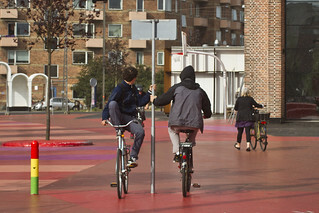 Staying in Copenhagen for a bit, people come from far and wide to see the bold, red design of Superkilen square, designed by starchitect Bjarke Ingels. It may be a cool idea but I am thinking that the bold use of so much paint on this blank urban canvas is an integral part of the draw and fascination. 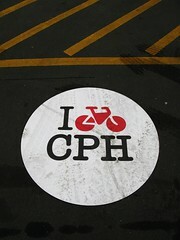 A few years ago, the city of Copenhagen's Bicycle Office wanted to the put down stickers on the cycle tracks. Heavy duty stickers that are applied with strong adhesives and put into place with heat in order to stay firm. They had many ideas for applications for the stickers, including using the bicycle office's logo and various encouraging texts like the ones on the bicycle railings that we have written about before and that Copenhagenize Design Company developed for the city. The Danish Road Directorate, however, would have none of it. The idea didn't fit into their very square and small box regarding usage of the pavement. A compromise was reached, so now and then we do see safety warnings using the stickers. Only on the cycle tracks however not the roads. The one, above, warns about blind spots on turning trucks. Another recent example from Copenhagen about the immovable attitude of the traffic engineers is an idea for the Copenhagen Bicycle Superhighway network. There was an incredibly simple wayfinding concept to let the users of the network know when they were actually on a stretch of bicycle superhighway. A continuous orange stripe along the entire route, no wider than the dividing line in car lanes. A stripe along the curb and across intersections that would be wonderfully simple to follow and inexpensive to implement. The traffic engineers at the Danish Road Directorate, however, suffered a mass outbreak of nervous tics when the idea was proposed. Unacceptable. Impossible. Simply can't be done. A lot of lobbying work took place but they refused to back down and accept the fact that new ideas need to grow. Even just getting the road directorate to add the new logo for the bicycle superhighway to the official signage along the routes was a major battle. A compromise was reached and the signage was allowed to be changed but the orange stripe idea had to die. And all this from the people who have engineered road markings like the kind you see when you look down upon our city from above. 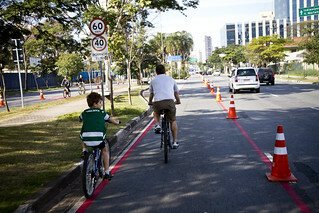 Even though the idea works just fine in Sao Paulo. The red stripes signify where the Sunday ciclofaixa lanes are, and yet they're in place all week. The paint that was used when the Albertslund route opened was just your standard house paint. I noticed last month that it had faded from most of the route. Although along one stretch, one of the municipalities had chosen to repaint the stripe, which is cool because it is probably ”illegal”. As I understand it, Copenhagen Blue was the preferred choice for the colour of bicycle infrastructure in some cities in America. Then they realised that blue had been allocated to handicap markings and signage and that's why America has gone green. In France, green is also the preferred colour for marking bicycle infrastructure. In the Netherlands many cycle tracks are paved with an earthy, reddish tint which is clearly different than the roadway. 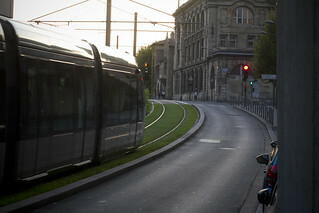 In Bordeaux, on stretches of tramway heading out of town, they simply plant grass between the tracks. 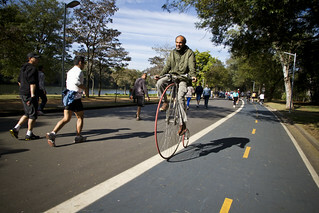 This bike path through a park in Sao Paulo is painted blue – sponsored by Volvo, actually. 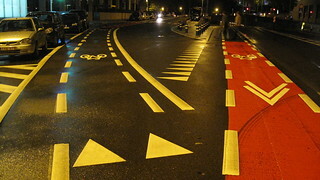 On this stretch of new cycle lane that I saw in Brussels in 2009, an angry, aggressive red was chosen. 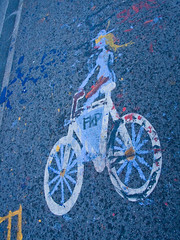 All sorts of dangerous connotations about cycling in the city are right there in that paint. With all that said, paint doesn't necessarily serve an intelligent purpose. When I was in Vienna at the Velo-City conference this year, I heard that the City of Vienna had plans to spend €100,000 on green painted cycle tracks. 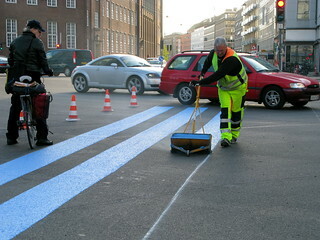 As you may know, the blue cycle track markings in Copenhagen are thermoplast - a mixture of pigmented plastic and sand is applied in a heated form. 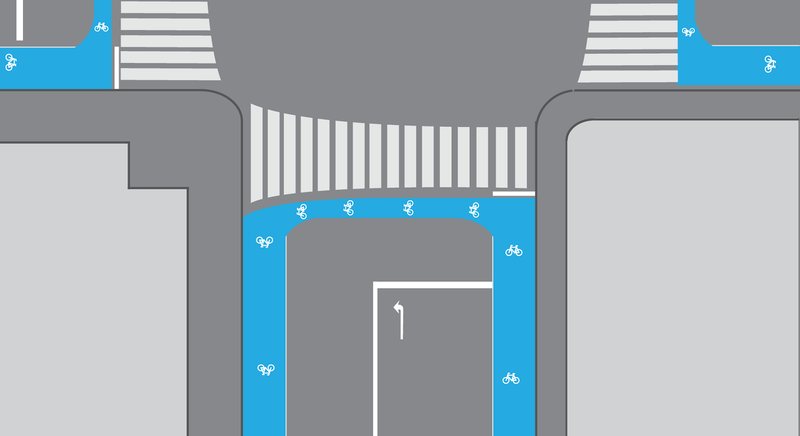 It has excellent traction when wet which is of course important if people on bicycles are using it. In Vienna, they were just going to use paint as though they were renovating the children's bedroom. I rode past one section that had already suffered this fate and I could smell it a couple hundred metres before I even reached it and a couple hundred metres after I passed by. Fail. I'm sure somebody will tell me in the comments that white isn't technically a colour but white, at the moment, is all we have to brighten up the fifty shades of grey in the form of pedestrian crossings and other street markings. I like pedestrian crossings so much I published a photo book about them. 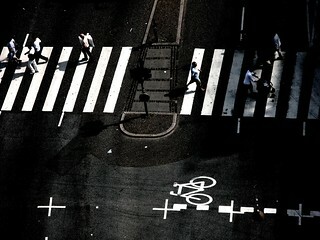 I have seen some artistic interpretations of pedestrian crossings and every time I see them I just think yes, yes, yes. More of that please. Even just extending the stripes of the pedestrian crossing to follow the actual desire lines of the pedestrians would be a massive improvement, as we suggested in our Choreography of an Urban Intersection study from last year. 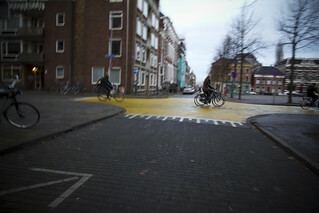 On a recent visit to Groningen, we passed through a couple of intersections painted in a bright, cheerful yellow colour. It really makes you think: why aren't all intersections in cities painted in bright colours? I live on a busy intersection and I look out my window at it several times a day. I can tell you that if it was yellow or even pink, it would look so much more attractive. 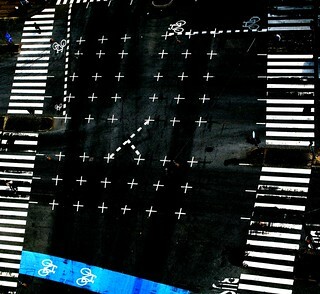 What about renting out the intersection surface for advertising, just in order to get some colour into the urban equation? Wait, no, of course that is a stupid idea but I hope you see my point. It's winter in Copenhagen so now, more than any other time of the year, I am desperate for some colour. So forgive that last comment. Most of the creative addition of colour in cities is not officially sanctioned like the yellow intersections in Groningen or experimental road markings in Copenhagen. Most is the work of activists or artists. Hey, isn't graffiti just a reaction against the drab and dreary urban pallete - and the society that created it? 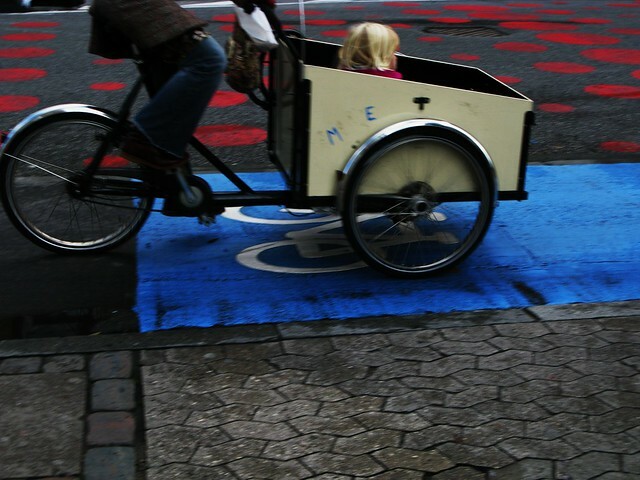 Here is a simple example of spicing up one of the classic bicycle symbols on a cycle track in Copenhagen. All of this dull and dreary grey in our cities makes traffic engineering sound like Henry Ford. ”You can have any colour of asphalt you want, as long as it's grey”. Times are changing though. Urban dwellers are demanding new and exciting additions to our cities. We are thinking out of the box like we have never done before. It is an exciting age. Nevertheless, there is room for improvement and for innovation. I'm certainly not suggesting that every square centimetre of roadway has to be artistically rendered in every colour available to us. I'm just saying that the rigid, last-century mentality about the sacred nature of the urban Wailing Wall - the city streets - has to be changed in order to accommodate all of these new schools of thought about how our cities can be made better, more modern and more human.